Several significant anniversaries are celebrated during our 2018-19 concert season. In October, we present a concert of contemporary works for choir and saxophone including pieces by our President, Will Todd. This concert is followed by a feast of polychoral Renaissance Christmas music in December. The sixtieth anniversary of the formation of the choir is marked in February with a special commission from renowned local composer Alexander L’Estrange and a seldom-performed unaccompanied work by Rachmaninoff. 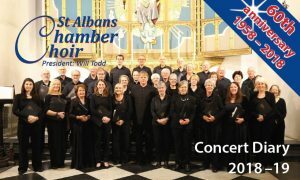 The concert in April, celebrating the fiftieth anniversary of our association with the Wormser Kantorei, features works by Mozart, Handel and Vaughan Williams. In June, music on the theme of war and peace commemorates the 100th anniversary of the signing of the Treaty of Versailles on 28 June 1919.